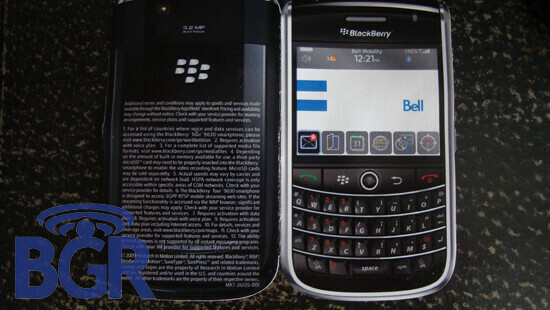 BlackBerry Tour Canadian bound for Bell? The BlackBerry Tour is already getting some attention from cellphone fans, awaiting the expected U.S. release July 13th at Verizon. And why not? With the Bold-like QWERTY keyboard, the 3.2MP camera with AF and flash, video capture and 3G connectivity, the Tour is fully loaded. Add in the latest OS build that could be as high as 5.0 by launch, and you can understand why the buzz is developing. It isn't right not to share all this 'Berry goodness with the other people living on this continent, and sure enough, BGR received some snapshots from a source that show the device with the Bell logo on the 480x360 display. The photo is said by the tipster to come from official Bell promo material, but alas, no release date or pricing information was mentioned. looks like a sweet phone. I'm looking forward to grabbing this phone when it is released on Verizon, any idea if the GPS is unlocked as well as standalone? its funny how all of your Verizon fan boys talk all this smack about the blackberry bold in comparison to your storm and now the equivalent of it is coming to your carrier and your all about it... idiots..